The teams at Domaine de Marlioz welcome you to Savoy. Rest and relax in our beautiful park, pamper yourself at our spa center, and tantalize your taste buds with our catering options. Between lake and mountains, Ibis Styles Aix-les-Bains Hotel welcomes you. Its 100 comfortable rooms have WiFi and breakfast included. 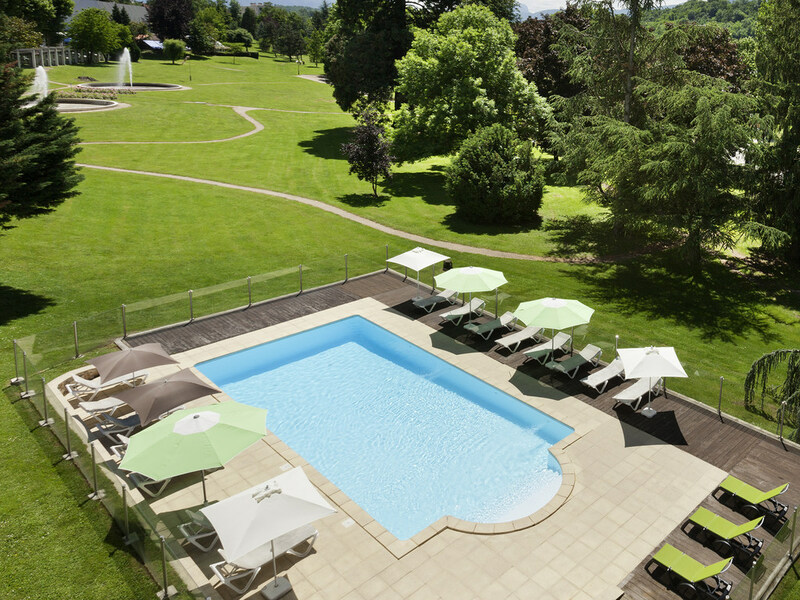 Enjoy the outdoor heated swimming pool in season, relax in the Espace F Elm (16+) with pool, sauna, hammam and whirlpool 200 m away (entrance fee, closed from June 17 to 26, 2019). Close to the city center, the hotel has 720 m² rooms for your meetings surrounded by nature. Discover the historic center of Aix-Les-Bains and the Savoie region. Visit Annecy, Chambéry, the Château des Ducs de Savoie or Hautecombe Abbey, and relax on a boat trip across Lake Bourget. Discover local flavors in leafy surroundings. Depending on your preference and the season, enjoy our shaded terrace or our bright dining room and sample our quality dishes accompanied by our best wines! The Amadeus bar at this Mercure hotel is open from 7am to 11pm daily. Be inspired by our varied menu! When the weather is nice, enjoy your favorite drink out in the sunshine or under the shade of a parasol.